Please full view before commenting Oh yea read first too! This anime is the one I'm AFRAID to wall the most,Yes it's true! Give me any anime and I'll wall it just don't give me Chobits! Why? For one thing the hair is deadly! so is the dress of most of her scans but I'm glad I faced my fear and challenged this wallpaper phew! I should have finished it last week but then since it's one of my fears, I stopped for 2 days or so before continuing it almost thinking of giving up. Why did I wall it? It's because I want to try other categories so before I go to other categories I need to face it first. The hair consists of 550 layers! The style of it is new and not seen in my other walls took me 3 days for it alone! I had fun with the frills even though it was hard. Tina18 gave me the idea that I can use other colors and not follow the original scan when she commented on my last wallpaper and I tried it here. Thanks! It's my first time doing curtains and I want it simple and neat so there you have it! Thanks to tina18 and kitten! liked the floor, gave more depth. I like the carpet as well, rare to see it. if you can make the red curtains and put them behind her I think it'll be better. love the look and the composition of the whole atmosphere and wall. You're really talented aswell. Keep up the good work! uwaaaa beautiful *_*! you did Chii *__*! and turned her into Freya *___*! I love her hair and eyes *_*! and everything! 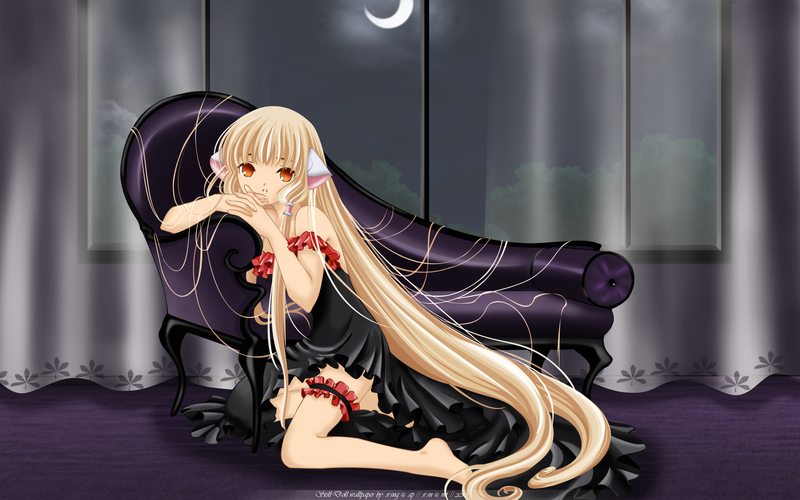 Really Nice, im a huge chobits fan and i have to say this is a quality wallpaper, i shall add it to my collection. paint to vector? its beautiful! ?????? ???????! Good Very Good Wallpapers! Thanks! chii is so pretty in your wallie! Wow really nice,it's a great work, thanks for share. Greetings.